Access to education varies by geographic location, race, gender, and class. Describe the upsides and downsides to the current educational system in the U.S. In the United States, as in most countries, people with more education tend to enjoy higher economic status, power, prestige, and levels of income. Dropout rates are higher in certain locations and among minorities. In some areas, the best high schools are private high schools that may be out of reach for poorer students who cannot afford the tuition. U.S. public schools lag behind the schools of other developed countries in the areas of reading, math, and science. dropout rates: Dropout rates are a measurement of the proportion of students who drop out, that is, who leave a school for practical reasons, necessities, or disillusionment with the system from which the individual in question leaves. In the United States, as in most countries, people with more education tend to enjoy higher economic status, power, prestige, and levels of income. One might expect, then, that all people would try to maximize their education. After all, education is meant to be the great equalizer by which anyone can climb the rungs of the social hierarchy. However, evidence suggests that certain groups have unequal access to education. In the United States, public schools provide free education through 12th grade, but post-secondary college education is not free. Costs include tuition and room and board, even at public institutions. Those who are unable to afford the expense of college, therefore, have unequal access. According to a 2005 report from the OECD, the United States is tied for first place with Switzerland when it comes to annual spending per student on its public schools, with each of those two countries spending more than $11,000. However, the United States is ranked 37th in the world in education spending as a percentage of gross domestic product. All but seven of the leading countries are in the third world, ranked high because of a low GDP. U.S. public schools lag behind the schools of other developed countries in the areas of reading, math, and science. Even in high school, economic, family, and social demands may lead some students to drop out before finishing. Thus, sociologists have observed that dropout rates vary among different social groups. For instance, dropout rates are lowest among Asian Americans, followed closely by whites. But Hispanic, black, and Native American students drop out at rates nearly double those of Asian and white students. Overall, the dropout rate has been declining for decades, since at least the 1970s, yet it remains disproportionately high for minority students. School funding varies by geographic location. In part, the disparities in dropout rates may be a symptom of disparities in access to high quality education. In some areas, the best high schools are private high schools that may be out of reach for poorer students who cannot afford the tuition. Even public schools may receive different rates of funding; in particular, schools in poorer areas tend to receive less funding because school funding is often tied to property taxes. Thus, students who live in poorer areas may have less access to high quality education. One of the biggest debates in funding public schools is funding by local taxes or state taxes. The federal government supplies around 8.5% of the public school system funds, according to a 2005 report by the National Center for Education Statistics. The remaining split between state and local governments averages 48.7% from states and 42.8% from local sources. However, the division varies widely. In Hawaii local funds make up 1.7%, while state sources account for nearly 90.1%. 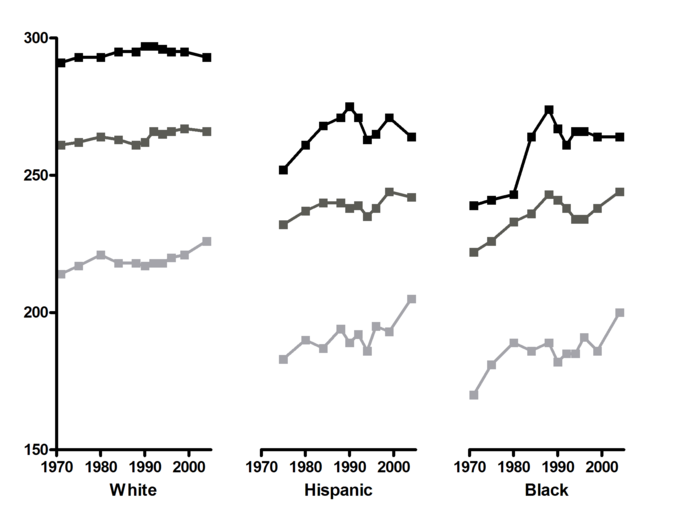 Trends in reading scores by race, 1970–2004: Reading- ages 9 (light gray), 13 (dark gray), and 17 (black). Trends in reading scores collected by the National Assessment of Educational Progress (NAEP), with the light-gray line indicating data collection at age 9, dark-gray at age 13, and black at age 17. White, hispanic, and black students all improved their reading scores as they aged. Notably, however, the achievement gap between white vs. black and hispanic students has narrowed over time but has by no means disappeared; white students still show the highest achievement in reading. English as a second language (ESL) refers to the use or study of English by speakers with different native languages. Describe some of the difficulties and challenges facing ELL students in the U.S.
English language learners (ELL) must learn to speak and write English in addition to learning substantive content in schools. ELL students are often tracked with lower ability students because they have lower standardized test scores, which may inaccurately measure their academic ability. ELL students are more likely to drop out. In the U.S., schools may let ELL and other low-scoring students drop out in order to raise average test scores. ELL students may have trouble earning the English credits necessary to be accepted into college. On average, ELL students come from poorer families than native speakers, which presents an additional barrier to college. ESL programs may help ELL students form friendships and encourage social interaction, tolerance, and multicultural values. tolerance: The ability or practice of tolerating; an acceptance or patience with the beliefs, opinions or practices of others; a lack of bigotry. native speaker: A person who grew up with a particular language as their mother tongue. Standardized Test Scores: A standardized test is a test that is administered and scored in a consistent, or “standard”, manner. English as a second language (ESL), English for speakers of other languages (ESOL) and English as a foreign language (EFL) all refer to the use or study of English by speakers with different native languages. Generally, English Language Learners (ELL) are refugees, immigrants, or their children. They must learn English as a Second Language (ESL) in order to function in their new host country. In the U.S. over the last twenty years, more than 70% of non-English-speaking school-age immigrants have arrived in the U.S. before they were 6 years old. At this age, they could have been taught English in school, and achieved a proficiency indistinguishable from a native speaker. In other countries, such as the Russia, France, Spain, and Germany this approach has dramatically improved reading and math test scores for linguistic minorities. Supporters of ESL programs claim they play an important role in the formation of peer networks and adjustment to school and society in their new homes. Having class among other students learning English as a second language relieves the pressure of making mistakes when speaking in class or to peers. ESL programs also allow students to meet and form friendships with other non-native speakers from different cultures, promoting racial tolerance and multiculturalism. Nevertheless, ELL students face predictable difficulties in learning English. Those whose native languages are drastically different from English may find it especially difficult to learn the sounds and grammar of English, while others whose native languages are more similar may have less trouble. But these students also face difficulties unrelated to learning the language itself, including the possibility of having their abilities underestimated, a higher probability of dropping out, difficulty paying for and succeeding in college, and social problems connecting with native speakers. ELL students are often tracked with lower ability students because they have lower standardized test scores, which may inaccurately measure their academic ability. ELL students are also more likely to drop out of high school. Their higher dropout rates may be due to difficulties in keeping up in mainstream classes or to prior interruptions in their formal education. For example, some ELL students may have spent time in refugee camps where they had no opportunity to attend school. Further, some have speculated that school administrators may actually encourage ELL students to drop out because it may increase the school’s overall average test scores, which may in turn benefit the school (e.g., by ensuring continued funding). ELL students face additional barriers to pursuing higher education. Most colleges and universities require four years of English in high school, but many will accept only one year of ESL English. ELL students who arrive in the United States relatively late may find it difficult to meet this requirement because they must spend a longer time in ESL English classes in high school, or because they might not arrive early enough to complete four years of English in high school. Consequently, some ELL students lack the required credits to apply for college. ELL students can also face financial barriers to higher education. Those who do not place high enough on college placement exams often have to enroll in ESL courses at their universities. Often, they must pay fees for these courses in addition to tuition, and these courses may not count as credit towards graduation. These additional fees add to the financial burden faced by ELL students who often come from families of lower socioeconomic status. The latest statistics show that the median household income for school-age ELL students is $36,691 while that of non-ELL students is $60,280. ELL students often have difficulty interacting with native speakers. ELL students may avoid interactions with native speakers because they are frustrated with or embarrassed by their English ability. Immigrant students often also lack knowledge about popular U.S. culture, which limits their conversations with native speakers to academic topics. In classroom group activities with native speakers, ELL students often do not participate, again because of embarrassment of their English, but also because of cultural differences which value silence and individual work at school over social interaction and talking in class. These interactions have been found to extend to teacher-student interactions as well. In most mainstream classrooms, teacher-led discussion is the most common form of lesson. In this setting, ELL students will fail to participate, and often have difficulty understanding teachers because they talk too fast, do not use visual aids, or use native colloquialisms. ELL students also have trouble getting involved with extracurricular activities with native speakers for similar reasons. Students fail to join extra-curricular activities because of the language barrier, cultural emphasis of academics over other activities, or failure to understand traditional pastimes in their new country. 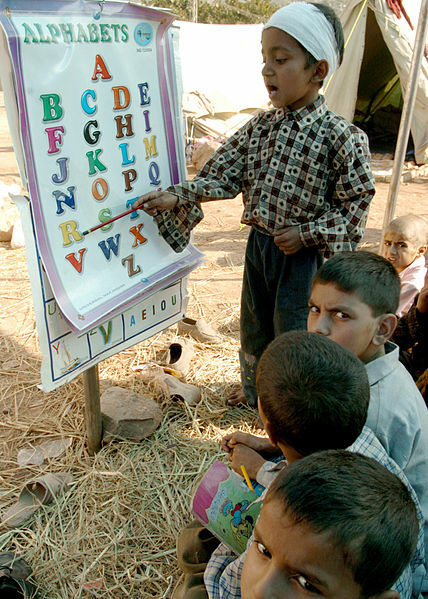 While education can improve life chances, not everyone has equal access to education. The more education people have, the higher their income, the better their life chances, and the higher their standard of living. Dropout rates also vary geographically, with the lowest rates in northern states. The relationships students have with their peers also influence a student’s likelihood of dropping out. Academic Risk Factors: Academic risk factors refer to the performance of students in school and are highly related to school-level problems. These factors include absenteeism, grade retention, special education placement, low performance and grades, and low educational expectations. life chances: Life chances (Lebenschancen in German) is a political theory of the opportunities each individual has to improve his or her quality of life. The concept was introduced by German sociologist Max Weber. It is a probabilistic concept, describing how likely it is, given certain factors, that an individual’s life will turn out a certain way. The more education people have, the higher their income, the better their life chances, and the higher their standard of living. In general, people with more education tend to earn higher incomes and enjoy a higher standard of living. High school dropouts are much less likely to be employed than those with high school and college degrees. Even earning a four-year degree can raise average weekly income by nearly $400. 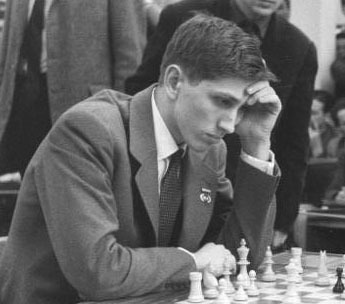 Bobby Fischer 1960 in Leipzig: Chess legend Bobby Fischer never finished high school; however, most high school dropouts do not achieve his level of success. Max Weber used the concept of “life chances” to express an individual’s access to employment opportunities and other resources. In part, life chances are determined by birth. An individual born into a wealthy family will have higher life chances than average because they will have access to greater opportunities from the moment they are born. Education also offers a means to improve one’s life chances by improving employment opportunities and making social connections. Thus, the consequences to dropping out can be high, as they significantly decrease the opportunity to improve one’s life chances. In addition to personal costs, dropping out has social costs. Dropouts have a greater likelihood of being arrested. Ultimately, this can lower the average standard of living for society as a whole. According to estimates, the average high school dropout will cost the government over $292,000. Not all students have an equal risk of dropping out. Students at risk for dropout based on academic risk factors are those who often have a history of absenteeism and grade retention, academic trouble, and more general disengagement from school life. Students may also be at risk for dropout based on social risk factors. Members of racial and ethnic minority groups drop out at higher rates than white students, as do those from low-income families, from single-parent households, and from families in which one or both parents also did not complete high school. Dropout rates also vary geographically, with the lowest rates in northern states. The highest dropout rates occur in the south and southwestern United States. Why else might students drop out? Sociologists tend to group dropout risk factors into different categories, including academic risk factors and school-level risk factors. Academic risk factors relate to the performance of students in school. School structure, curriculum, and size may increase the exposure of students to academic risk factors. For example, students are more likely to drop out when they attend schools with less rigorous curriculum, when they attend large schools, or when they attend schools with poor student-teacher interactions. The relationships students have with their peers also influence a student’s likelihood of dropping out. Students who build relationships with anti-social peers or who have deviant friends were more likely to drop out of school early regardless of their achievement in school. Relationships with parents can also influence a student’s decision to stay in school. The better the relationship, as demonstrated through positive interaction and parental involvement, the more likely the student will stay in school. If a student does not have a good relationship with her parents, the student is more likely to drop out even if she has good grades and good behavior. Students who drop out of school may identify different motivations, including uninteresting classes (a lack of engagement with school life and classes), feeling unmotivated (especially by teachers who did not demand enough or were not inspirational), personal reasons (had to get a job, became a parent, had to support or care for a family member), and academic challenges (felt like they could not keep up, felt unprepared for high school, had to repeat a grade, or graduation requirements seemed out of reach). Finally, some education researchers have noted that dropout rates may have been exacerbated by policies such as the U.S. No Child Left Behind Act that required schools to use high-stakes standardized testing as an accountability measure. These policies may have inadvertently encouraged students to drop out of high school, since teachers and administrators utilize grade retention as a strategy to improve test scores and ensure positive ratings for the school. As mentioned above, grade retention increases the likelihood that a student will drop out of school. School violence is a serious problem in the United States, and attempts to explain it identify both individual and social risk factors. Individual risk factors for school violence include a tendency to externalize problems, or act out, as well as developmental delays, low IQ, and reading problems. Social risk factors for school violence include an unstable home environment, violent neighborhoods, and certain characteristics of a school environment. A neighborhood environment may contribute to school violence when a community ‘s high rates of crime or drug use spills over into the classroom. Bullying may be committed by one student or a group of students. Physical bullying is the most easily identified and includes unwanted physical contact such as pushing, kicking, and tickling. It may also include the use of weapons. Verbal bullying is any slanderous statements or accusations that cause the victim undue emotional distress, such as insulting someone’s appearance, laughing at someone, or directing foul language toward someone. Emotionally bullying is any form of bullying that damages a victim’s emotional well-being, such as spreading malicious rumors, giving someone the silent treatment, or harassment. School Violence: School violence is widely considered to have become a serious problem in recent decades in many countries, particularly violence involving weapons. This includes violence between school students as well as physical attacks by students on school staff. School violence is a serious problem in the United States. This refers to violence between students as well as physical attacks by students on school staff. In 2007, a nationwide survey conducted by the Centers of Disease Control and Prevention found that, during the 30 days before they took the survey, 5.9% of students had carried a weapon to school, and 5.5% of students had skipped school because they did not feel safe. In the 12 months before they took the survey, 12.4% of students had been in a physical fight on school property at least once. Between 1996 and 2003, at least 46 individuals were killed in 27 school incidents involving the use of firearms. While these numbers are alarming, data also shows that most crimes at school are not violent. In 2001, students between the ages of 12 and 18 were the victims of two million crimes at school, but 62% of those crimes were thefts. In part, violence receives more attention because it draws media coverage. For example, school shootings account for less than 1% of violent crimes in public schools, yet nearly every school shooting makes national headlines. Nevertheless, because school violence can have such serious consequences, educators and policymakers take the issue very seriously. Prevention and intervention strategies may target individual students, families, the school community, or society in general. Individual-level strategies target at-risk or aggressive students and teach these students conflict resolution, problem solving, and social skills. Family-based solutions attempt to improve family relationships in order to improve students’ experiences while they are at home. School-wide strategies are designed to modify school characteristics associated with violence. Examples of this would be classroom practices that encourage student cooperation and close interaction with teachers, or the presence of police and law enforcement in schools to discourage violence. Finally, society-level prevention strategies attempt to change social and cultural conditions in order to reduce violence, regardless of where it occurs. For example, society-level strategies might try to reduce the violence portrayed in movies or music. In recent years, one particular type of school violence, bullying, has garnered special attention. Bullying can be committed by one student or a group of students. Typically, a group of bullies takes advantage of, or isolates, one student in particular and gains the loyalty of bystanders who, in many cases, want to avoid becoming victims themselves. Bullies typically taunt and tease their target before physically bullying their target. The targets of bullying are often students who are considered strange or different by their peers to begin with, making the situation harder for them to deal with. Often, victims are targeted based on their appearance, their gender, or their sexual orientation. Bullying is a common occurrence in most schools. According to the American Psychological Association, “approximately 40% to 80% of school-age children experience bullying at some point during their school careers. ” Bullying can be physical, verbal, and emotional. Physical bullying is the most easily identified and includes unwanted physical contact such as pushing, kicking, tickling, or the like, and may also include the use of weapons. Verbal bullying is any slanderous statements or accusations that cause the victim undue emotional distress. This can include insulting someone’s appearance, laughing at someone, or directing foul language toward someone. Emotionally bullying is any form of bullying that damages a victim’s emotional well-being, such as spreading malicious rumors, giving someone the silent treatment, or harassment. Bullying can also take place over the internet with text messaging. This “cyber-bullying” is particularly pernicious because it can be done anonymously, without detection by parents or authorities. Bullying: Bullying is an increasingly recognized problem in schools. Homeschooling is the education of children at home rather than in the setting of a school. Motivations for home schooling vary, but may include dissatisfaction with the school environment, religious or moral reasons, or dissatisfaction with the quality of academic instruction provided in local schools. The legal status of home schooling varies by states, but in all cases, homeschooled students must meet certain requirements and are subject to certain assessments to ensure the quality of education. Homeschooled students have varying access to resources, including extracurricular activities. home schooling: Homeschooling or home school (also called home education or home-based learning) is the education of children at home, typically by parents but sometimes by tutors, rather than in other formal settings of public or private school. Homeschooling is the education of children at home, typically by parents but sometimes by tutors, rather than in other formal settings of public or private school. In the United States, about 2.9% of students, or about 1.5 million children, are homeschooled. Most homeschooled children are homeschooled only, but about one in five are also enrolled in public or private schools, which they may attend for 25 hours or less each week. By enrolling part-time at a school, homeschooled students can study subjects such as foreign languages and sciences, which may be more difficult to teach at home. They may also be eligible to participate in academic and athletic extracurricular activities. Motivations for homeschooling vary, but may include dissatisfaction with the school environment, religious or moral reasons, or dissatisfaction with the quality of academic instruction provided in local schools. Surveys suggest that the most common motivations for homeschooling are concern about the school environment (e.g., safety, drugs, or negative peer pressure), a desire to provide religious or moral instruction, and dissatisfaction with academic instruction at other schools. Parents may also choose to homeschool children with special needs that the parent feels the school cannot or will not meet. Other, less common motivations include concerns about family time, finances, travel, and distance. In the United States education is compulsory. Every state has some form of a compulsory attendance law that requires children in a certain age range to spend a specific amount of time being educated. The most common way for parents to meet these requirements is to have their children attend public school. However, parents have always had some degree of choice in where and how children are educated. Thus, the legality of homeschooling has been debated, and that debate has focused largely on whether it is legal for parents to withhold children from school and educate them in a home setting. Since the 1980s, the focus of the debate has shifted to questions about the distribution of resources and state control over homeschooling. The legality of homeschooling is generally accepted, but debate continues over whether homeschooling communities can access state school funds, facilities, and resources and whether the state can regulate areas like curricula and standardized testing. States also differ in the level of resources they make available to homeschooled students. A minority of states require public schools to give homeschooled students access to district resources, such as school libraries, computer labs, extracurricular activities, or even academic courses. In some communities, homeschoolers may meet with a teacher periodically for curriculum review and suggestions. Other states give districts the option of giving homeschooled students access to such resources. Access to interscholastic athletic competition varies from state to state. Some state athletic associations ban homeschoolers from interscholastic competition, both by prohibiting homeschoolers to compete for a state federation member school as well as by prohibiting member schools to compete against independent teams made up of homeschoolers. In such states, homeschoolers may only compete amongst other homeschoolers or against schools that are not members of the state’s interscholastic athletic federation. Other states allow homeschoolers to compete for the public schools that they would otherwise attend by virtue of their residence. Still other state interscholastic athletic associations allow homeschoolers to organize teams that compete against other established schools, but do not allow homeschoolers to compete on established school teams. A standardized test is a test that is administered and scored in a consistent manner. Standardized tests are one common method by which schools measure students’ academic achievement, and they may also be used to measure students’ progress and teachers’ effectiveness, or in order to assess whether students are ready to progress to the next stage in their education. One of the main advantages of standardized testing is that the results can be empirically documented. Critics point out that standardized tests actually evaluate three things: what students learn in school, what they learn outside of school, and their innate intelligence. Critics worry that standardized tests lead teachers to “teach to the test”. Testing bias occurs when a test systematically favors one group over another, even though both groups may be equal on the trait the test measures. No Child Left Behind required that states assess educational achievement and allocate resources using standardized tests. Testing bias occurs when a test systematically favors one group over another, even though both groups are equal on the trait the test measures. standardized tests: A standardized test is a test that is administered and scored in a consistent, or “standard”, manner. No Child Left Behind: The No Child Left Behind Act of 2001 (NCLB) is a United States Act of Congress that came about as wide public concern about the state of education. NCLB is a reauthorization of the Elementary and Secondary Education Act, which included Title I, the government’s flagship aid program for disadvantaged students. NCLB supports standards-based education reform based on the premise that setting high standards and establishing measurable goals can improve individual outcomes in education. Testing Bias: Testing bias occurs when a test systematically favors one group over another, even though both groups are equal on the trait the test measures. Standardized tests are one common method by which schools measures students’ academic achievement. These tests may be given periodically and repeatedly to measure students’ progress and teachers’ effectiveness, or they may be given at key points during students’ careers to assess whether they are ready to progress to the next stage in their education—often, the next grade level or college. A standardized test is a test that is administered and scored in a consistent manner. They are designed so that the questions, conditions for administering, scoring procedures, and interpretations are purportedly without bias. One of the main advantages of standardized testing is that the results can be empirically documented; the test scores can be shown to have a relative degree of validity and reliability, being generalizable and replicable. Standardized tests allow educators, policymakers, and admissions committees easily and fairly compare results from different students. It may be difficult to account for differences in educational culture across schools, difficulty of a given teacher’s curriculum, differences in teaching style, and techniques and biases that affect grading. This makes standardized tests useful for admissions purposes in higher education, where a school is trying to compare students from across the nation or across the world. Critics worry that standardized tests lead teachers to “teach to the test. ” Standardized tests can be useful tools for assessing student achievement, and they can be used to focus instruction on desired outcomes, such as reading and math skills. However, critics feel that overuse and misuse of these tests harms teaching and learning by narrowing the curriculum. While it is possible to use a standardized test without letting its contents determine curriculum and instruction, frequently what is not tested is not taught, and how the subject is tested often becomes a model for how to teach the subject. Further, standardized tests tend to measure only one sort of knowledge, while discounting creativity and diverse modes of expression. In essence, standardized tests use a one-size-fits-all theory, which is not always an effective way to measure students’ knowledge and comprehension. Students who fail standardized tests may be diagnosed with learning disabilities or disorders instead of recognized for the skills they have, which are consequently left unchallenged and undeveloped. Finally, critics have expressed concern that standardized tests may create testing bias. Testing bias occurs when a test systematically favors one group over another, even though both groups are equal on the trait the test measures. 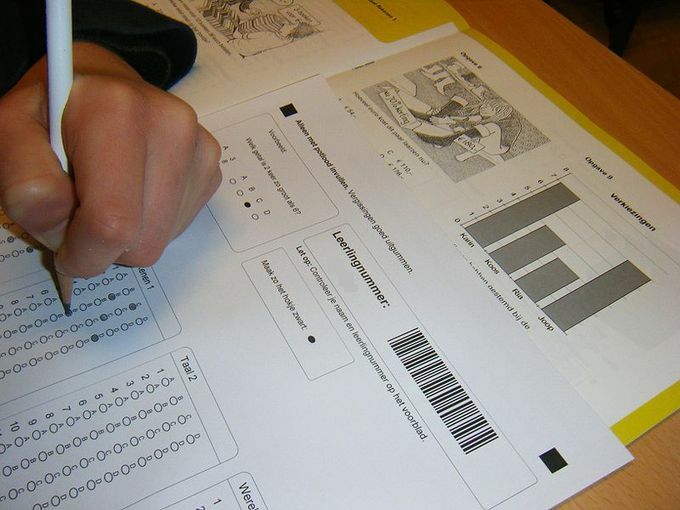 Critics allege that test makers and facilitators tend to represent a middle class, white background and standardized testing matches the values, habits, and language of the test makers. Students who share that background may have an advantage on standardized tests that has nothing to do with academic achievement or aptitude but is due to shared cultural background. In 2001, the United States passed the No Child Left Behind Act, which requires all states to test students in public schools statewide to ensure that they are achieving the desired level of minimum education. Although some states already had statewide standardized testing requirements, for many states, this act required them to create new systems. The act reinvigorated debate over the accuracy, efficacy, and justice of relying on standardized tests to measure student achievement. However, critics charge that standardized tests have become a mandatory curriculum placed into schools without public debate and without any accountability measures of its own. Many feel this ignores basic democratic principles in that control of schools’ curricula is removed from local school boards, which are the nominal curricular authority in the U.S. The act is especially controversial because it ties funding to standardized test schools. Under the act, students and schools must demonstrate “adequate yearly progress. ” That is, they must show some improvement every year. When a student fails to make adequate yearly progress, schools must provide tutoring or other interventions to help the student improve. When schools fail to show adequate yearly progress, they may lose funding or be taken over by the school board or state. In many places the United States, standardized tests are also used as a graduation requirement. Students must pass a standardized test in order to graduate from high school. The General Educational Development (GED) test, is often used as an alternative to a high school diploma. During high school, students may also take standardized tests as a requirement for applying to college. The most common standardized tests for applying to college are the SAT and ACT. Multiple Choice Test: Some standardized testing uses multiple-choice tests, which are relatively inexpensive to score, but any form of assessment can be used. There is no standard definition of “gifted,” nor a standard way of implementing gifted education. Common forms of education for the gifted have included acceleration, pull-out, cluster grouping and summer enrichment. According to the 1972 Marland Report, gifted youth are more likely than average to experience academic failure and develop social and emotional problems. Gifted education received federal support during the Cold War, but that support has recently been eroded. Controversies exist over the appropriateness of different forms of gifted education and their emotional effects on students. cluster grouping: Cluster grouping is the gathering of four to six gifted and talented or high achieving students in a single classroom for the entire school day. gifted: Endowed with special, in particular intellectual, abilities. pull-out: Gifted students are pulled out of a heterogeneous classroom to spend a portion of their time in a gifted class. Though gifted education programs are widespread, there is no standard definition of “gifted,” nor a standard way of implementing gifted education. Gifted education programs are justified by a two-pronged argument: First, gifted and talented youth are not adequately challenged by the standard curriculum and therefore require accelerated curricula or enrichment activities to reach their full potential. Second, gifted and talented youth are inherently at-risk. This second argument may seem counter-intuitive, but it has gained general credibility. This argument was formally articulated by the 1972 Marland Report by then U.S. Commissioner of Education S. P. Marland. According to the report, gifted youth are more likely than average to experience academic failure and to develop social and emotional problems. Gifted students may experience social rejection and difficulty making friends, as well as grapple with fear of failure and perfectionism. They may intentionally play down their abilities in order to make friends. They are also more prone to depression, anxiety and disengagement, as well as to behavior problems and drug and alcohol abuse. This may be in part due to a need for stimulation beyond what they receive in a typical classroom. Since the early 20th century, definitions of “gifted” have been based on IQ, or intelligence quotient. Different schools may set different cut-offs for defining giftedness, but a common standard is the top 2% of students with an IQ score of about 140 or above. More general definitions of giftedness may also evaluate students’ capability in areas like intellectual, creative, artistic, or leadership capacity, or in specific academic fields. Evaluations may be based on portfolios of student work, classroom observations, and achievement measures. Gifted education programs take many forms, including a combination of acceleration, pull-out or cluster grouping, and enrichment activities. Acceleration programs may compact curriculum or allow students to self-pace. In compacting, students are pre-tested to determine which skills or content they have already mastered, thus allowing students to skip repetitive practice. This reduces boredom and frees time to work on more challenging material. In self-pacing, students advance at their own speeds. In general, acceleration programs advance students to higher-level material suited to their abilities and preparedness – students may skip grades, skip ahead in particular subjects, or enroll at local community colleges. 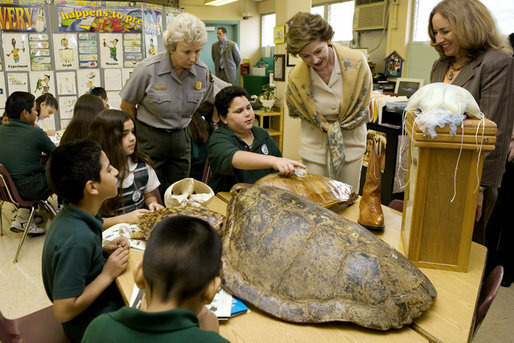 Gifted Class: Laura Bush listens to a student talk about sea turtles during a 2006 visit to Banyan Elementary School in Miami, FL, in support of education about parks and the environment. An alternative to acceleration is pull-out or cluster grouping, in which gifted students are removed from regular classrooms. In pull-out programs, gifted students spend most of the school day with a regular classroom of mixed abilities, but may be pulled out for an hour or part of a day to practice critical thinking drills, creative exercises, or subjects not introduced in standard curriculums. Pull-out programs are generally ineffective at promoting academic achievement since they do not align with the regular curriculum. Finally, summer enrichment presents gifted students with extra material above and beyond the standard curriculum. Students spend school days with a regular classroom, but also complete enrichment activities given as a modified assignment by the regular classroom teacher. These could include formal programs like Odyssey of the Mind or academic competitions like National History Day. 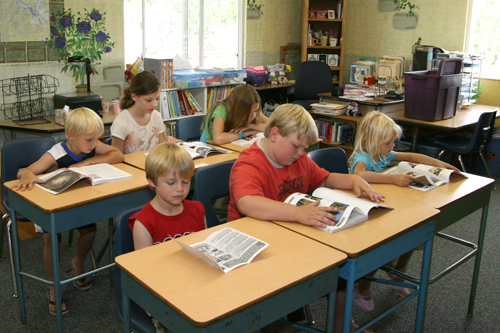 Summer enrichment programs typically operate like summer camps, as students pay a fee to attend and may enroll in programs that typically focus on one subject. In any case, enrichment work is done in addition to regular school work. Controversies concerning gifted education are varied and often highly politicized. They are as basic as agreeing upon the appropriateness of the term “gifted” or the definition of “giftedness. ” For example, does “giftedness” refer to performance or potential? Many students do not exhibit both at the same time. Measures of general intelligence also remain controversial. Early IQ tests were notorious for producing higher IQ scores for privileged races and classes and lower scores for disadvantaged subgroups. Although IQ tests have changed substantially over the past half century, and many objections to the early tests have been addressed by “culture neutral,” IQ testing remains controversial. 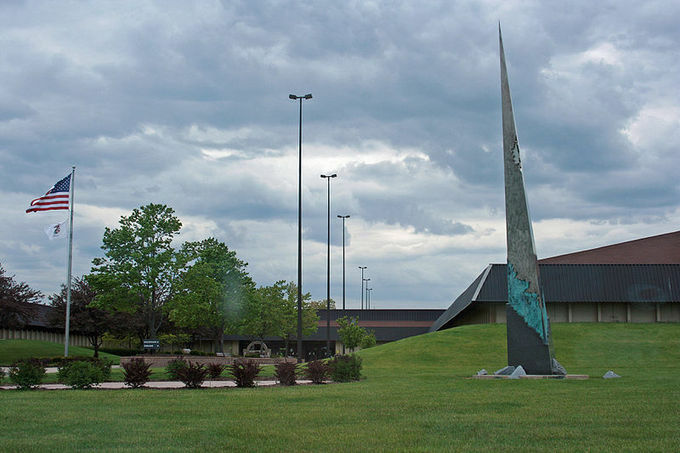 Illinois Mathematics and Science Academy: Schools like the Illinois Mathematics and Science Academy cater to the needs of gifted students. Educational Reform in the U.S.
Education reforms aim at redressing some societal ills, such as gender-, and class-based inequities, or instructional ineffectiveness. Educational reform has been closely tied to efforts to promote democracy. Another motivation for reform is the desire to address socioeconomic problems, such as health, wealth and well being, which many people see as having roots in unequal access to education. In the 1980s, conservative reformers tried to limit federal involvement in education, and E.D. Hirsch argued education must teach cultural literacy. In the 1990s and 2000s, reformers pushed for outcomes-based education with an emphasis on assessment. Teachers’ unions are considered by many to be the major barrier to continued reform. Persistent issues in educational reform include school funding, school choice, and alternatives to public education. school choice: School choice is a term used to describe a wide array of programs aimed at giving families the opportunity to choose the school their children will attend. cultural literacy: Knowledge of and ability to discuss the history of and major concepts underlying a culture, particularly one’s own and those of one’s peers. outcomes-based education: Outcome-based education (OBE) is a student-centered learning philosophy that focuses on empirically measuring student performance, which are called outcomes. OBE contrasts with traditional education, which primarily focuses on the resources that are available to the student, which are called inputs. Education reform has been pursued for a variety of specific reasons, but, generally, most reforms aim at redressing some societal ills, such as poverty-, gender-, or class-based inequities, or perceived ineffectiveness. The idea that all children should be provided with a high level of education is a relatively recent idea, and has arisen largely in the context of Western democracy in the twentieth century. In fact, educational reform has been closely tied to efforts to promote democracy. Many students of democracy desire to improve education in order to improve the quality of governance in democratic societies. The necessity of good public education follows logically if one believes that the quality of democratic governance depends on the ability of citizens to make informed, intelligent choices, and education can improve these abilities. In the United States, for example, democratic education was promoted by Thomas Jefferson, who advocated ambitious reforms for public schooling in Virginia. Another motivation for reform is the desire to address socioeconomic problems, which many people see as having roots in unequal access to education. Starting in the twentieth century, people have attempted to argue that small improvements in education can have large returns in such areas as health, wealth and well being. For example, in developing countries, increases in women’s literacy rates were correlated with increases in women’s health, and increasing primary education was correlated with increasing farming efficiencies and income. Even in developed countries, an individual’s level of education may predict the type of career and level of income that person can expect to achieve. Other education reforms have been motivated by attempts to improve the effectiveness of instruction. Many modern reforms have attempted to move away from a model of education in which a teacher lectures and delivers facts to a passive student audience. For example, M. Montessori argued that education must take into account the individual needs of each child. John Dewey suggested that effective education poses problems and puzzles that motivate children to learn. Over the years, education reform has focused on different goals. From the 1950s to the 1970s, many of the proposed and implemented reforms in U.S. education stemmed from the Civil Rights Movement and related trends; examples include ending racial segregation and busing for the purpose of desegregation, affirmative action, and banning of school prayer. In general, these reforms gave more students from more diverse backgrounds access to education. In the 1980s, the momentum of education reform moved from the left to the right. For example, E.D. Hirsch put forth an influential attack on progressive education. He argued that progressive education failed to teach “cultural literacy,” the facts, phrases, and texts that Hirsch asserted every American had once known and were still essential for decoding basic texts and maintaining communication. Hirsch’s ideas remain significant through the 1990s and into the twenty-first century and are incorporated into classroom practice through textbooks and curricula published under his own imprint. In the 1990s, most states and districts adopted Outcome-Based Education (OBE) in some form or another. Under OBE, a state would create a committee to adopt standards and choose a quantitative instrument (often, a standardized test) to assess whether the students knew the required content or could perform the required tasks. During this period, the U.S. Congress also set the standards-based National Education Goals (Goals 2000). Many of these goals were based on the principles of outcomes-based education, and not all of the goals were attained by the year 2000 as was intended. The standards-based reform movement culminated in the No Child Left Behind Act of 2001. In general, OBE reforms attempt to increase accountability in education. Rather than reforming the educational process, they focus on the effects that process achieves by measuring outcomes (e.g., student achievement). A central issue for educational reform advocates today is school choice. Debates over school choice focus on advocates’ claim that school choice can promote excellence in education through competition. A highly competitive “market” for schools would eliminate the need to otherwise enforce accountability from the top down. According to advocates, schools would naturally regulate themselves and attempt to raise standards in order to attract students. Most proposals for school choice call for vouchers. Public education vouchers would permit guardians to select and pay any school, public or private, with public funds currently allocated to local public schools. In theory, children’s guardians will naturally shop for the best schools, much as is already done at the college level. Many attribute the purportedly slow pace of reform in the United States to the strength of teachers’ unions. In some school districts, labor agreements with teachers’ unions may restrict the ability of school systems to implement merit pay and other reforms. In general, union contracts are more restrictive in districts with high concentrations of poor and minority students. Education Segregation in the U.S. Prior to Brown v. Board of Education: Educational reforms during the 1950s, 1960s, and 1970s focused on civil rights, especially desegregation and affirmative action.